5 - reduction or disappearance of pain. 2 - The vertical load is the basic element for full compliance of anisotropy , that is , the mechanical characteristic "essential to the functionality of the cartilage". 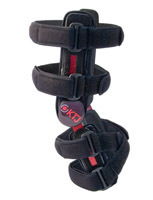 KTJ brace, in fact, reflects as fully as indicated by Insall (considered the pioneer of knee prothesis ) who said that an orthopedic device oriented to knee support must be designed to correspond to " a specific biomechanical condition for which the instantaneous center of rotation must fall on the perpendicular point of contact between the articular surface, so that the articular surfaces or ligaments, or both, are not forced in articular movement into an unnatural direction" (1986). - the reduction or disappearance of pain ; the onset of pain inevitably leads to the interruption of activity in motion and to the subsequent rehabilitation process. variable center of rotation knee tutor promotes the recovery of a good level of autonomy in activity of daily living without causing unnecessary stress on the ligaments and fascial of the knee. The device also determines an immediate reduction of pain and an improvement of balance and deambulation reducing the risk of falls'.